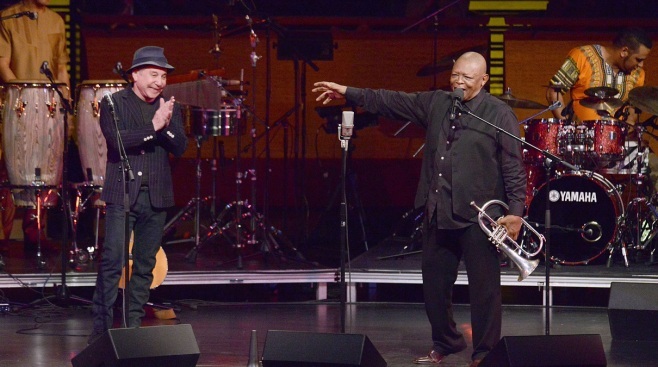 Masekela and Simon performed together on the 1986 album, "Graceland"
Paul Simon (L) and Hugh Masekela perform during the Hugh Masekela: Celebrating 75 Years concert at Rose Theater, Jazz at Lincoln Center on April 4, 2014 in New York City. South African trumpeter and vocalist Hugh Masekela celebrated his 75th birthday with a little help from some old friends — Paul Simon and Harry Belafonte — in the city where he began what turned out to be a 30-year exile from his homeland. Introducing Simon near the end of Friday night's concert at Jazz at Lincoln Center's Rose Theater, Masekela noted that millions of people "who had never heard of South Africa before were just charmed and turned around by the album he made" in 1986— "Graceland," which won Grammys for Album and Record of the Year. Masekela did not perform on the singer-songwriter's groundbreaking world music album much of which was recorded in South Africa when he was still exiled because of his attacks on the apartheid regime. But he and his former wife, singer Miriam Makeba, joined Simon on his "Graceland" world tour which gave South African musicians global exposure. Masekela and Simon then sang two of the album's biggest hits — "The Boy In the Bubble" and "You Can Call Me Al" — backed by his quintet of young musicians, all but one of them from South Africa. Earlier, singer Sibongile Khumalo earned a standing ovations as she joined Masekela for one number, displaying the multi-octave range and powerful voice that has earned her the reputation as South Africa's "First Lady of Song." Masekela's son, Sal, opened the concert by noting that his father has been "sharing the gift and the joy of music to people all around the world for the last five decades. For some reason, he does not get old." Masekela, who turned 75 on Friday, proved that by performing for more than two hours — playing fluegelhorn, singing, engaging in call-and-response patterns with the audience, and even throwing in a few dance moves. He offered a retrospective of his biggest hits including: "Bajabula Bonke (The Healing Song)"; "Stimela (Coal Train)," in which he imitated the sounds of the train bringing conscripted black men from all parts of southern Africa to work under exploitative conditions in the gold mines around Johannesburg; and the joyful 1968 pop instrumental hit "Grazing in the Grass," during which the audience heeded his request to "stand up and shake some booty." He also performed Bob Dylan's "It's All Over Now, Baby Blue," describing its composer as "one of the greatest warriors against injustice," a nod to the years he spent in the late '60s on the West Coast where he recorded with The Byrds and performed at the 1967 Monterey Pop Festival. Masekela later gave a shout out to Belafonte who was seated in the audience, describing how the singer helped bring him in 1960 to study at the Manhattan School of Music after he left South Africa as the apartheid regime became increasingly repressive following the Sharpeville Massacre in which dozens of black protesters were killed by police. A year earlier, Masekela co-founded the Jazz Epistles, the first black South African jazz group to record an album. Most of its members left the country after the government banned concerts and radio broadcasts by prominent African artists. Masekela described Belafonte as "not only my father by also my mentor," giving him advice that helped turn his life around. "He advised me, 'I know that you came here, you love to play jazz, but you should put some of that stuff from your home into what you do." Masekela closed the concert by paying tribute to his close friend and No. 1 fan, Nelson Mandela, observing that Mandela and other African National Congress leaders were thrown into prison as young men, only to be released as old men decades later. Masekela returned to his homeland after Mandela's release in 1990. "Their spirit wasn't broken and they said to us to try and forgive those people who oppressed you ... and build this country together ... but never again in the future of this country will one group of people ever get to dominate another," he said, noting that this month South Africa will be celebrating its 20th anniversary as a free nation. He then performed his song "Bring Him Back Home (Nelson Mandela)," inspired by a letter from Mandela smuggled out of prison in April 1985 wishing the trumpeter a happy 46th birthday. The song which became an anthem of the anti-apartheid movement anticipated the day Mandela would walk freely down the streets of Soweto with his wife. The evening ended with Masekela's son bringing a birthday cake onstage as the audience sang "Happy Birthday."